What better way to prepare for a challenge than to learn from the experience and advice of former winners? 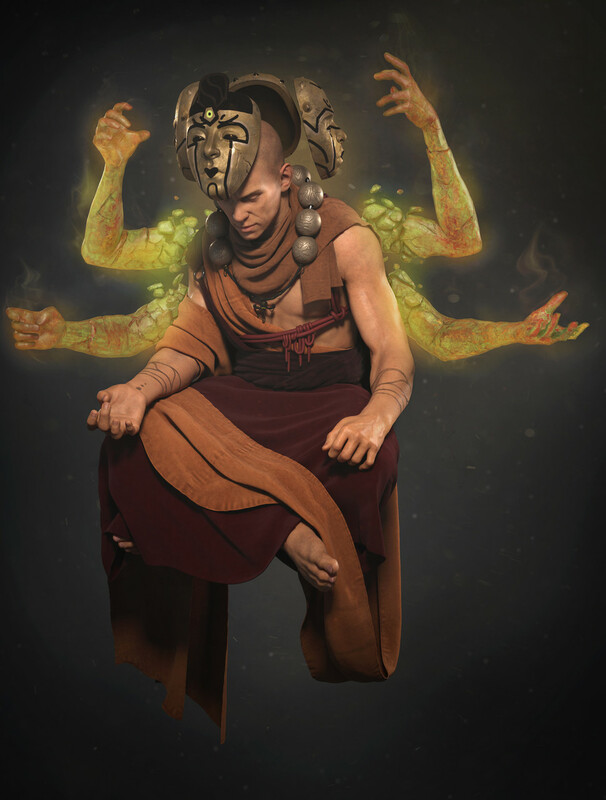 We interviewed the winners of the Film/VFX rendered Character portion of the Ancient Civilizations Challenge so that you can go into the next one ready and inspired! See what our winners Remy Dupont, Mahabir Singh and Alexia Rubod have to say! Alexia, you participated in both phases of the challenge. Do you think that gave you any kind of advantage/disadvantage? Was your experience different for each phase? Alexia: The great thing about the first phase was the fact that it allowed me to actually sit down and think things through, instead of going straight into 3D and having a sketchy direction. I had this idea of mixing skin and crystal from the start and it was very interesting to try out different characters and combinations and be able to pick the one I liked the most in the end. But I did approach this first phase in a more laid back way, since I am not a character designer and was mostly doing it for fun. The production phase was the one where I really wanted to focus, learn new things and push my limits! Remy and Mahabir, you chose to pick a concept from Phase 1 of the Challenge. What drew you to the concept you chose? Remy: I looked at a lot of concepts during Phase 1. When I found Ivan’s concept I knew at once that was the one I wanted to use, because his character had so much soul. Mahabir: When I first looked at the concept, the first thing that came to my mind was a monk who is controlling his thoughts and senses (lust, rage, greed, conceit) through meditation. Silviu Sadoschi did an amazing job with the concept. Remy: My main motivation was to learn and improve my skills, and be free to experiment. Mahabir: This was actually the first competition I took part in and I think this is the best venue to meet artists around the world and get feedback from them. I also wanted to make a portfolio ready piece. Alexia: I loved the idea of open submissions where you can see everybody’s progress and artists can feedback and support each other. I saw it as a great opportunity to learn. Also when I joined the challenge, the first phase had already started for a week or so. The theme was so inspiring and people were already posting such insanely bold projects, that I got instantly motivated to try something out too. Remy: My main strategy was to respect all the steps of production and spend as much time as possible on the model, to make sure I had a solid base from which to work on the texturing and shading. 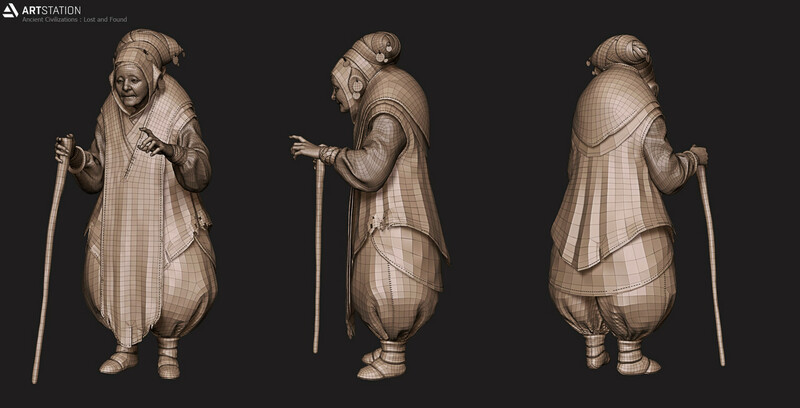 Mahabir: I started out with a base mesh, then blocking out the character in Zbrush. I then used Marvelous Designer for the clothing, Maya for re-topology and Zbrush to finish my high poly. 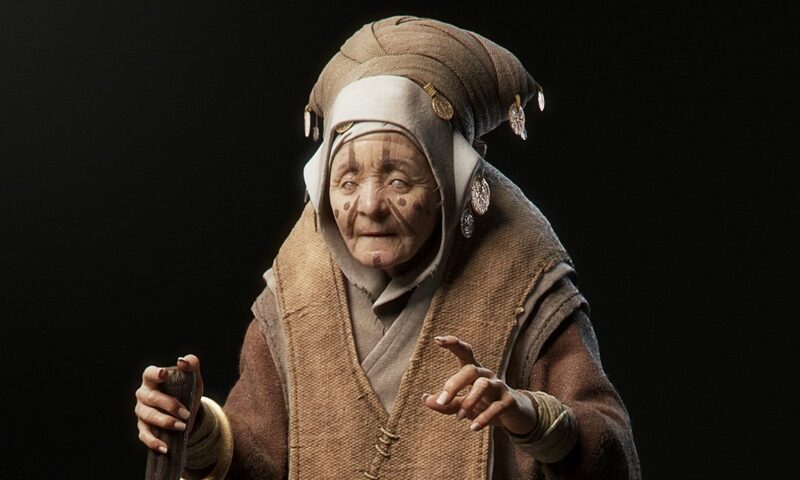 Substance painter was used for texturing and Arnold for rendering. 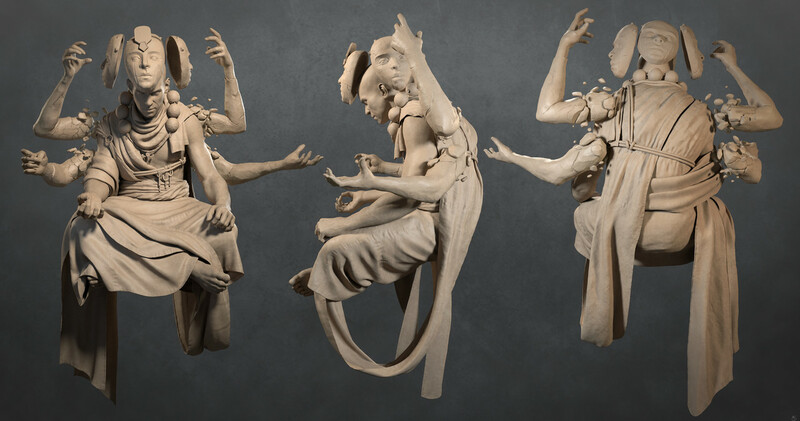 Alexia: My creation steps probably don’t differ much from everybody else’s : creating a mesh with a clean topology in T pose, then blocking a pose, sculpting details for the displacement map, surfacing, lighting, etc. The tricky part was that I had no idea how I was going to do some things at the start, like crystal, cracks on the body and cloth. So I had to plan out time for research, learning new programs and figuring out a proper workflow for everything. Remy: I followed quite a lot of challengers, as I love watching the process everybody goes through in order to create their characters. But I worked closely with my wife Ellie Dupont and my good friend Mickael Krebs. Mahabir: Yes, I was following many talented artist’s submissions. I liked two submissions the most, one is Subi Prakash‘s and the other is Hugo Leygnac‘s. I liked Subi’s character and the way he did the clothing and pose of the character, that was just amazing. Hugo did a great job with compositing. Alexia: I really enjoyed going through people’s work in every categories, it was always such an inspiration boost! I especially enjoyed checking Brian Bedford’s Red Witch because the stylisation of the character was so well managed, he really gave her his own twist. I’m sad he didn’t get to finalize in time. I was also obsessed with Ellie Dupont‘s submission, all of the details of her Prophet were wicked. I don’t know how she managed so much patience! 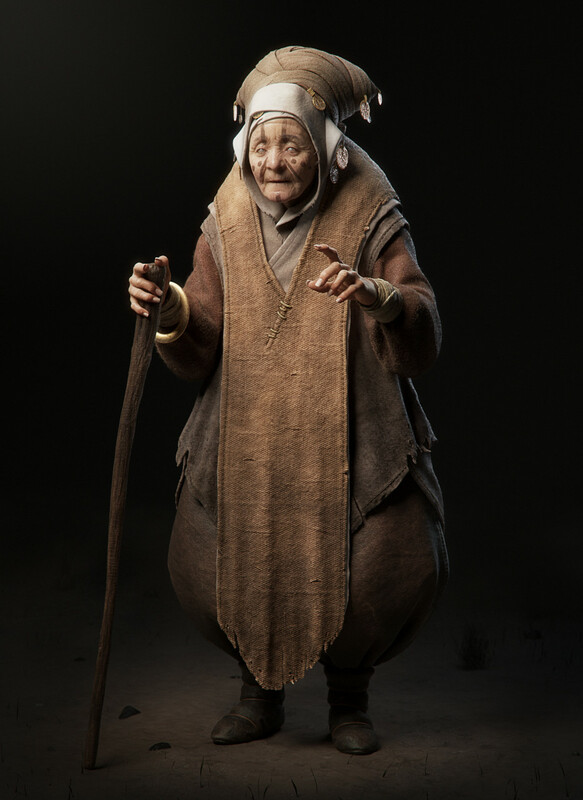 And the original concept by Florian Coudray was outstanding too. It was fun to watch this character come to life. Remy: The hardest part for me has been to stay motivated right to the end of the challenge, as it’s not always easy to balance work and family life and to add the challenge on top of that. Towards the end of the challenge I found that I had to take a short break, which helped me to return to my work with a fresh eye. Mahabir: The most difficult part was giving the same feel of arms as they were in original concept. Alexia: Keeping track of time! 8 weeks seems like a long time at first glance, but the problem when you get really passionate about a project is this feeling that you can always push things further. Overall, I’m satisfied with my final submission but there are so many small aspects that I would have liked to polish a bit more. I guess that’s the blessing and the curse of detail-oriented people. It’s a good thing there is a deadline forcing us to wrap things up, because it could go on forever ! Remy: For me, I feel I gained confidence. I now know that I can take a character through the entire pipeline. Mahabir: I learned a lot while doing the challenge. Especially building my pipeline for production characters. Alexia: Learning. First and most important thing, I feel I’ve gotten better through the challenge and that is the best satisfaction ever. Also, it allowed me to connect with many, many artists and to get contacted by a few studios. I couldn’t have asked for more! Remy: Be humble about your work and don’t be afraid of posting updates even if you are not satisfied with them. I think it’s important for people to see how much work goes into creating a character and that it is not going to look polished and perfect until it reaches those final stages. I hope this will help others to stay motivated. Mahabir: Be patient with your art. Don’t participate to win, participate to learn. Alexia: Be organized. The deadline is sooner than you think! And talk to people. This is an awesome community. People are full of great advice and always willing to help. And it also doesn’t hurt to give away some constructive critics and nice comments! It keeps alive the good energy of the challenge. 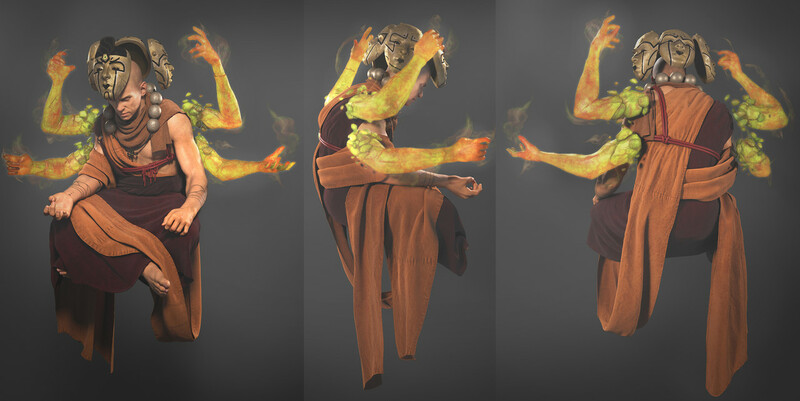 See more submissions for the Ancient Civilizations Film/VFX Character challenge here.